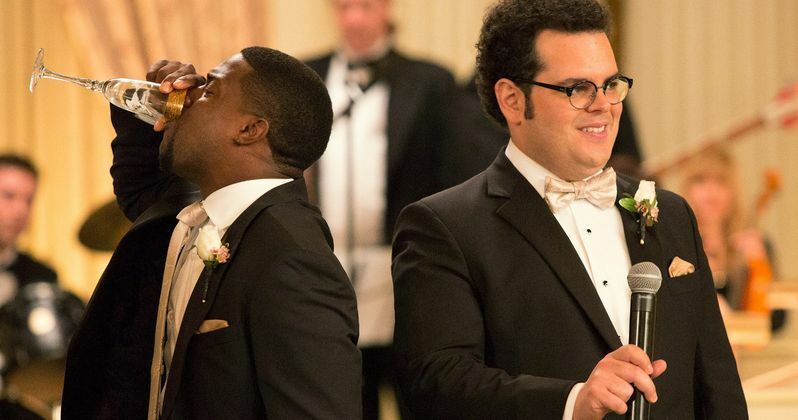 Kevin Hart and Josh Gad make one mean comedy team in the all-new trailer for The Wedding Ringer, which finds the unlikely pair joining forces to tackle true love in the most unusual way. Jimmy (Kevin Hart) hires himself out as a best man to socially challenged grooms but discovers his biggest challenge in Doug (Josh Gad), who has not only faked the name of his best man to his excited fiance, but 9 groomsmen as well. Will everything come together for their big day? Or will Jimmy and Doug blow it in a big way? Check out the latest footage from what is sure to be one of this January's biggest hits! In The Wedding Ringer, Jimmy (Kevin Hart) provides best man services for socially challenged guys, who - for whatever reason - have no one close enough to agree to stand by them on the day of their wedding. Doug (Josh Gad) a groom-to-be, has found himself in just such a situation, but, to make matters worse, he fabricates the names of not only a best man but nine groomsmen as well. When all else fails, Doug seeks out Jimmy's services to carry out a charade designed to make Doug look his best, but threatens to destroy everything if it fails.